This is it. You've planned, saved and booked your dream vacation to the tropics. You leave in a couple of days and it's time to finish shopping and begin packing your bags. You run through your vacation in your mind: days on sandy beaches, snorkeling in the clear warm waters, massages, boat rides, lunches by the pool and sunset dinners. Now comes the important part: packing for the beach. Pack too little and you'll end up wishing for your favorite pair of sandals or running shoes. Pack too much and you will end up dreading the plane and boat transfers while traveling to your destination. If you plan to stay at several different resorts or visit a few different islands, packing light becomes even more important. If you are on your honeymoon, taking a sea plane or a helicopter with your bags, there is a weight and space limitation. 1. Don't forget the essentials: sunglasses, hat, sunscreen, bathing suit and your mask. We've heard from many travelers who bring 10 pairs of shoes but forget a bathing suit. You can do some shopping when you get there, but having a comfortable swimsuit in your bag that you can slip on and jump in the water as soon as you arrive is a must. 2. Although it takes a bit of space, your own mask will fit better than a rental. If you love spending time in the water, a leaky mask can ruin the experience. Rental fins are easier to get used to, so if you need to cut items, leave the fins at home. 3. Bring your own sunscreen rather than planning on buying one at the resort to avoid any allergies to chemicals and perfumes. You won’t be able to go without a sunscreen. 4. A UV proof rash guard is a must in the tropics. While you are snorkeling, the sunscreen will wash off and you could end up with a nasty burn. If you put on a comfortable rash guard, your back and neck will be well protected. Get one with long sleeves – you won’t get hot because the water will cool off your body. 5. Find out if you can do laundry while you are there. If you can wash your clothing at least once, you can cut the number of t-shirts, shorts and pants in half. The more expensive hotel laundry service is usually available. 6. If you love organizing, use an app like Stylebook to create lunch and dinner outfits, or make a simple list. Keep in mind that you may end up relaxing by the pool during the day, so pack comfortable dresses which you can slip over a bathing suit and have lunch by the pool. Many tropical resorts are quite casual so you don't have to worry about packing a jacket or a tie like you would in the city. The same goes with shoes - you can usually wear flip-flops to dinner even at five star resorts, but it depends on your destination. If you are not sure, call the resort concierge and ask ahead of time. 7. Once you are done with the list, look it over for items that may not be very useful. If you are missing a few items, allow some time before departure for last minute shopping. Certain destinations like Waikiki are a shopper’s paradise, so you can stock up once you get there. But if you are going to a remote destination like Fiji or Bora Bora, choices will be limited. 8. If you have heavy items like golf clubs, consider using a baggage delivery service. You can also FedEx or UPS a bag to your hotel but be sure to call the concierge and make sure that they can hold the items for you. 9. Remember to leave some space in your suitcase for new items which you will purchase on vacation. Even if you are not planning on doing a lot of shopping, you will probably end of purchasing a few clothing items and souvenirs. Many suitcases have a zipper expansion feature which lets you pack in extra items. However, with airline weight restriction limits, this may put you over the weight allowance and you'll end up paying extra fees on the way back. 10. If you are not sure whether you should bring something, remember that less is more when vacationing in the tropics. There are additional things to consider when traveling with little kids. They will near similar clothing and gear as adults, from sunglasses to hats and UV proof clothing. If you are not using sunscreen at home, be sure to test a few brands before the trips because a kid’s skin is very sensitive. It will be difficult to keep them out of the sun and out of water so be sure to get them at least one great rash guard. 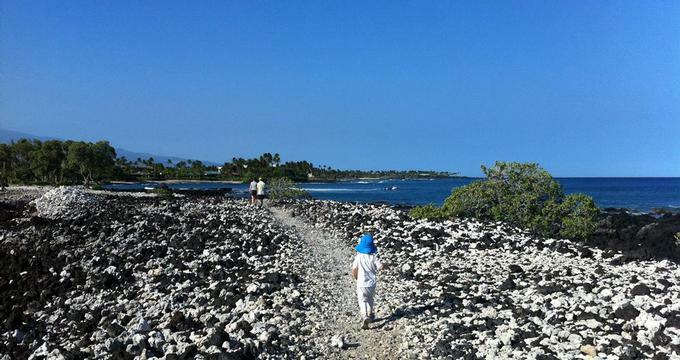 When we were in Hawaii with our 2 year old son, he wore long light summer pants - it protected his knees from accidental scrapes and falls, as well as from the strong tropical sun. When it gets windy, which happens frequently on an island, you should make sure that your child is warm enough, especially in the morning and at night after sundown. Read our tips for traveling with little kids on a long airplane journey. Google Maps: How Does Google Navigation Work?